Synopsis: To avenge the murder of his father and the slaughter of his Cimmerian village, Conan (Jason Mamoa) goes on a quest to find and kill the sadistic warlord responsible. However, this warlord, Khalar Zym (Stephan Lang), is on his own quest to find an elusive young woman, Tamara (Rachel Nichols), the key to an enigmatic ritual of resurrection. 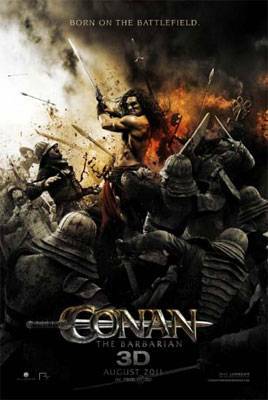 When Conan abducts Tamara and uses her as bait, he is pursued by armies, besieged by monsters and led to a site of primeval magic and human sacrifice. Verdict: Conan The Barbarian tells the tale of "Conan the Cimmerian and his adventures across the continent of Hyboria on a quest to avenge the murder of his father and the slaughter of his village". Conan The Barbarian is a reasonably fast-paced film with a few well choreographed, blood-fuelled, action scenes. I enjoyed the beginning of the film most, where we see Conan as a young boy. What was different is the film does not contain a lot of dialogue; there is however a loud orchestra playing throughout the entire film. Conan The Barbarian would be a great movie to take the man in your life too, it's bloodier and raunchier than other action movies and it's unintentionally funny... I'm sure the ladies will enjoy it too, as Jason Mamoa has worked really hard to buff up for the film. Verdict: With big shoes to fill, while the new generation will think that Conan has little dialogue, those of us who grew up with Arni will think he's a chatterbox by comparison. A great take on a classic, and young Conan made a great addition the movies insight into the character. Plenty of gore, I'm still having trouble iwth the nose scene but guys I'm sure you will love it. Great movie for all, with plenty of action.